Stretching: What Does It Really Mean? This article from the Yoga International archives originally appeared in in the October/November 2001 issue of Yoga International, and was adapted from Coulter's book Anatomy of Hatha Yoga. If you ask what it takes to lift a barbell overhead most people will say muscles, bones, and joints. If you ask them what is needed for running a marathon they will say heart, lungs, and legs. And if you ask them what is required for dance or gymnastic performance they will say strength, grace, and agility. But if you ask them what is most important for increasing flexibility they will probably just give you a blank look. And yet those of us who practice hatha yoga know that improving flexibility is one of our greatest challenges. Even the simplest postures are difficult when one is stiff, which is why instructors are always encouraging us to stretch. But what exactly do they mean? First of all, stretching doesn’t mean trying to increase flexibility by loosening up cartilaginous restraints, joint capsules, tendons, or ligaments, or by freeing up bony stops. A cartilaginous restraint is like a gasket and should permit only slight movement. Joint capsules surround and protect the slippery surfaces of synovial joints, and trying to loosen them may result in serious destabilization. Ligaments, which by definition connect bone to bone, can barely lengthen four percent before they start tearing, and unless they have been abnormally shortened by immobility it is not even a good idea to lengthen them. Tendons, which by definition connect the bellies of muscle to bone, can be considered, but they have a structure similar to that of ligaments and will not permit much expansion. First of all, stretching doesn’t mean trying to increase flexibility by loosening up cartilaginous restraints, joint capsules, tendons, or ligaments, or by freeing up bony stops. What we can do is lengthen nerves and the bellies of muscles—the two kinds of soft anatomical structures that run lengthwise through limbs and across joints. And indeed, these are the two kinds of structures that have to be lengthened to permit a full range of flexibility in hatha yoga. Muscles have to be lengthened only a little to permit a respectable improvement in a joint’s range of motion, and this allows us reasonable opportunities for change. But when we are stretching them, are we dealing with their individual muscle fibers, or with their associated connective tissue fibers? We are dealing with both. Experimental evidence has shown that if a muscle is held in a cast in a stretched position, its individual muscle fibers grow in length by adding the little contractile units called sarcomeres. And by the same token, if a muscle is held by a cast in a foreshortened state, sarcomeres are lost and the muscle fibers become shorter. To increase flexibility it is not enough to increase the length of muscle fibers alone. A matching expansion of the connective tissue within and around the muscle is also needed, including the overlying fascia (the connective tissue that surrounds packets of muscle fibers) and the wrappings of individual fibers. And this is what happens during programs of prolonged stretching. The connective tissue gradually follows the lead of the muscle fibers, the muscle as a whole gets longer, and flexibility is improved. Hatha yoga stretches are a safe and effective way to bring this about. And in the occasional cases when we want to tighten everything down, all we have to do is stop stretching. The muscle fibers get shorter; the connective tissues follow suit. Peripheral nerves are another matter. They are sensitive to stretch but are not robust enough to limit it; they can accommodate to stretch only because they take a meandering course through the tissues that surround them and because their individual nerve fibers meander back and forth within the connective tissue ensheathments of the nerve itself. During the course of stretching a limb, the gross path of a nerve through the surrounding tissues is first straightened, and as the stretch continues the serpentine course of the individual fibers within the nerve are also straightened (the enveloping connective tissue has enough elasticity to accommodate about 10–15 percent additional stretch without damaging the nerve fibers). Without their connective tissue ensheathments nerves would be hopelessly vulnerable, not only to stretch but also to trauma and to compression among tense muscles, bones, and ligaments. The protection is not absolute, however, because in extreme cases these ensheathments can accommodate to even more stretch than the 10–15 percent that is safe for their enclosed nerve fibers. The early warning signs are numbness, sensitivity, and tingling, and if these are ignored, sensory and motor deficits may develop. Your best protection is awareness and patience—awareness of why nerve stretch is a potential problem and the patience to work slowly when and if mild symptoms emerge. If nerve pain keeps turning up chronically, seek professional help. Let’s use sitting forward bends with one foot tucked in to observe how muscles can respond to stretch. To begin, sit on the floor, stretch one leg out in front of you, and pull the other foot in toward the perineum. The thighs will be at about a 90˚ angle from one another, and you will be facing about halfway between the two. Next, to work with this posture conventionally, twist the spine 45˚ to face the outstretched leg and come forward without lifting your hands overhead or attempting to bend initially from the hips. Let the hands rest, depending on your flexibility, on the outstretched thigh, leg, or foot. Remain in the posture for about half a minute and then slowly unroll, first at the hips and then in the lumbar region. Finally, lift the head and neck. Repeat on the other side. This forward bend toward one foot is useful for several reasons. First, with one knee flexed, it is stretching the hamstrings on only one side. Second, even though it is stretching the adductors to some extent on both sides, it creates more stretch on the side to which you are reaching because the knee on that side is extended. This is one of the best possible postures for working with the adductors on one side at a time. Finally, the forward bend from a 45˚ cant of the pelvis creates less stress on the hip joint and lower back than the posterior stretch, making this posture more rewarding for beginners. After getting accustomed to this pose, try a variation. Again come into the preliminary position with the right knee extended, but instead of reaching out directly toward the right foot, press your left forearm against your left knee. (In most students, this will pry the right hip off the floor. That’s fine.) Now reach out and slide the right hand against the floor halfway between the two thighs. This will stretch the adductors on the right more than the previous posture. Then reach two-thirds of the way toward the left side to relieve some of the adductor tension, and last, reach a third of the way from the right side to increase it. Finally, after exploring these poses, come back to the original posture and reach straight toward the right foot. You will find that you are able to come further forward. The hamstrings are still resisting almost as much as before, but the stretches off axis from the extended knee have lengthened the adductors on that side. The increase in how far you can now reach is a rough measure of how much they were contributing to your limitations in the initial posture. If you hold these poses for only a minute or so you are working mainly with the nervous system, which is allowing muscles to relax. 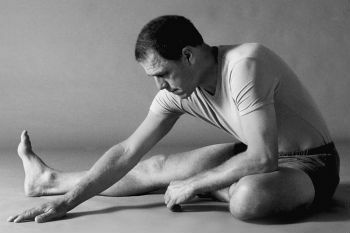 But if you are patient, slow everything down, and work with the postures over a longer period of time, sarcomeres will gradually be added to the adductors and the hamstrings, connective tissue will follow more slowly, and the lengthened muscles, including connective tissues, will allow you to come more deeply into the forward bend. As far as the peripheral nerves are concerned, if you do not experience tingling, you can assume they are not a problem, but if you experience symptoms, they may need more time to acclimate to the lengthened muscles. One caution: to increase flexibility, always do a balanced set of postures, including passive stretches as well as strength-building exercises such as standing postures.Look for the middle ground. If you single-mindedly attempt to lengthen only one or two classes of muscles (such as the adductors and the hamstrings) you’ll end up imbalanced and soon hurt yourself because you are not familiar with the new situation you have created. It is better to work with the body as a whole, and to become generally stronger and more flexible. Research has shown beyond question that the length of muscle fibers can be increased as a result of prolonged stretching or decreased as a result of chronic foreshortening. It is also clear that the connective tissue ensheathments of either muscles or nerves can be stretched too much. But there is another factor in the equation—the nervous system plays a pivotal role in causing muscles to either relax or tighten up, and this either facilitates stretch or limits it. So is it the active role of the nervous system or the passive role of the connective tissues that ultimately restrains movement? Since nerve impulses keep stimulating muscle cells during ordinary activities, there is only one way to find out for certain—to work with someone’s range of motion when they are under deep anesthesia, when the nervous system is not stimulating any skeletal muscle cells (except those needed for respiration). This has been done. Any operating room attendant can tell you that when patients are anesthetized the muscles become so loose that care has to be taken not to dislocate the joints, and this will happen even if the patient is extremely stiff in waking life. So why can’t therapists take advantage of anesthesia-induced flexibility to increase the range of motion around joints? The answer is that without the protection of the nervous system the tissues tear—muscle fibers, connective tissue fibers, and nerves. And this proves that even though connective tissues provide the outermost limits to stretch, it is the nervous system that provides the practical limits in day-to-day life. When we have reached those limits the nervous system warns us through pain, trembling, or weakness that we are going too far, and most important, it warns us before the tissues are torn. There is a small part of the brain called the cerebellum, which controls muscle tone, coordination, and balance. Nerve fibers from the proprioceptors go to the cerebral cortex (the part of the brain that is associated with conscious thought and emotions). So there is a continual flow of sensation to the brain and a continual flow of conscious and unconscious motor impulses coming from the brain. Long-term gains in flexibility depend on your ability to stretch the connective tissue binding your muscles, but your ability to do this is dependent upon your success in undoing protective reflexes, and this in turn is related to your ability to relax mentally. It is essential for you to realize that your state of mind and the force of your emotions can be even more difficult to overcome than the resistance of your muscles. 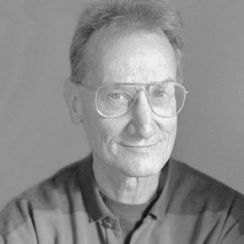 David Coulter, Ph.D., studied and taught in the field of anatomy and physiology of hatha yoga.